I have to be honest. Moldoveanu Peak is the mountain which I underestimated most of all EU Peaks. Starting at 2030m and looking at the map showing 2544m for the highest peak makes the underestimation easy. In the end, it became one of the toughest hikes with the first injury. On the other hand it became also the hike with one of the best views and least tourists. 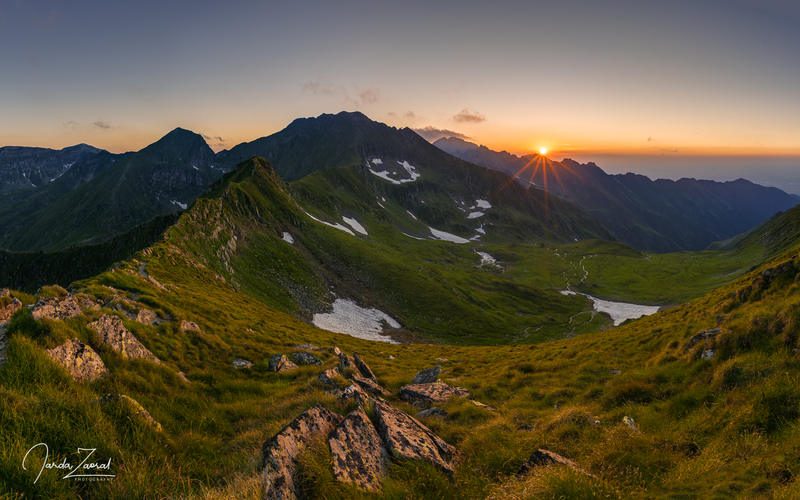 Follow my steps in the Făgăraș mountains. My trip to the highest peak of Romania started in a night train. I was lucky to book one of the last beds in the train so I could charge some energy before the fourth EU Peak in four days! 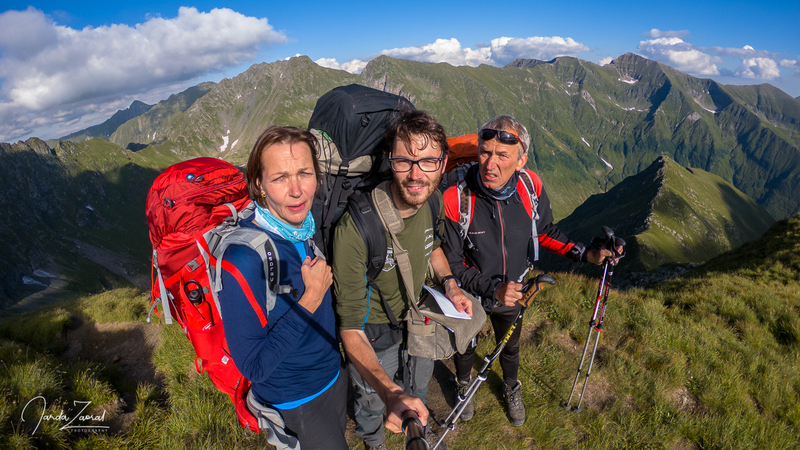 I was happy that also my mum wanted to join for one EU Peak and she chose Moldoveanu Peak. She was already waiting for me with my father in the city Făgăraș, the city which gave its name to the mountain ridge with the highest mountain of Romania. The city itself is though not interesting at all. We took a short lunch break and continued up to the mountains. Soon we reached the starting point of our hike which is located at Bâlea Lac pass. The drive up was epic and it is not surprising. The Transfăgărășan road was named one of the most amazing roads in the world, definitely the most scenic car drive of my trip. 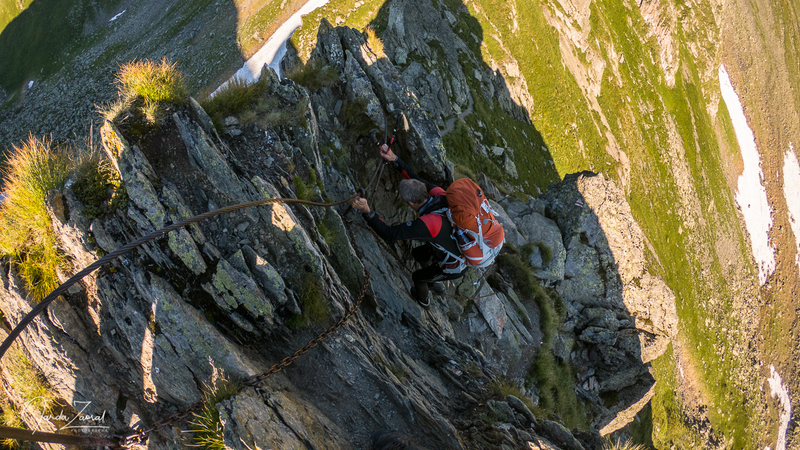 The weather forecast was very good so I made a brave plan to tent on Moldoveanu Peak. I was really looking forward to this challenge. My parents seemed to look forward too. We packed our bagpacks and I took all of my equipment with me including a tent, a sleeping bag, a mattress, clothes, food and of course my drone and all camera equipment. Altogether my bagpack was 30kg. This hike was supposed to be a test for a one week long hike across Swedish mountains. Is it a good idea? The initial climb to the mountain ridge isn’t really difficult and after half an hour you have a magnificent view. We thought that the toughest part was behind. Then, we walked on the ridge up and down and enjoyed amazing views around. I think you can’t find such a nice grassy landscape anywhere else. After ca 3.5km we stood in front of a fork. Should we take an easier route via refuge Cabana Podragu or should we take a more scenic route and continue on the mountain ridge via trail called “Three steps from the death”? We still felt in shape so we decided for the more challenging route. Unfortunately, that showed up to be a big mistake. The hike would be okay with light bagpacks but carrying 30 kg wasn’t fun at all. After a few hundred meters the most crucial part occurred. We had to use steel chains to get further up and subsequently down. At one point my mum lost balance and fell on her back. When my father and I looked at her we knew directly that this won’t be okay. “I twisted my ankle” she said in pain. 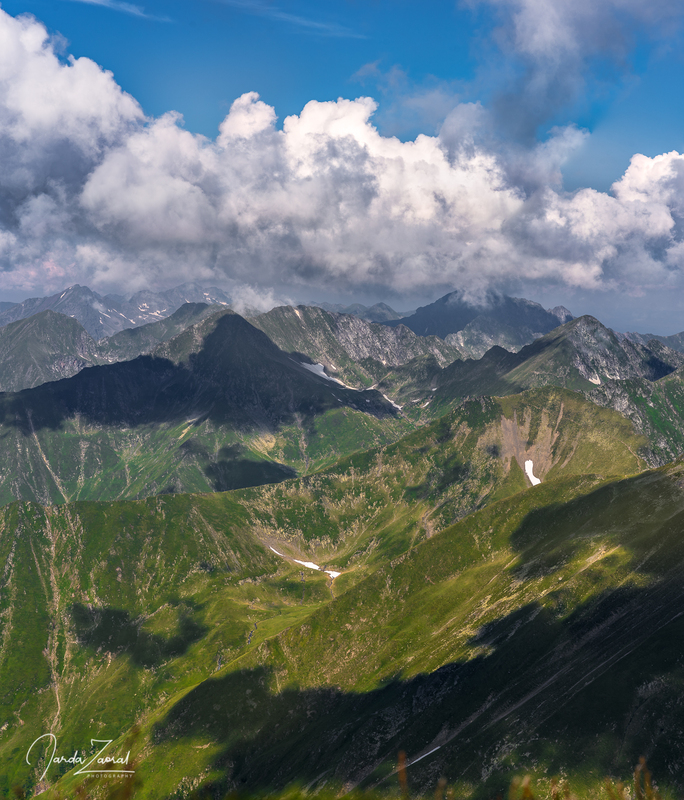 At this point, Moldoveanu Peak had to go aside. We had to come up with a rescue plan. I first thought we would have to call an ambulance but my mum said: “No, if I stop the ankle becomes swollen and it would be even worse. I have to continue to the nearest civilization.” My father and I were surprised by her decision but he couldn’t say anything against. She is the doctor. Looking at the map we were in the worst position. We were at two thirds in between our starting point and refuge Cabana Podragu. My mum refused to go back the same way so we decided to continue to the cabin. She tightened her shoes and we continued walking. We became slower and the sun started to go down. We realized soon that we won’t manage to reach the cabin before sunset. Instead, we decided to build tents. I found a nice tenting spot on top of a mountain only 40 meters lower than Moldoveanu Peak. Look at the view I had from my tent. After sunset we were planning what to do the following day. The shortest way for my mum to get to civilization was to continue to the cabin Podragu and then down through a valley to village Arpașu de Sus so we decided for that. My father wanted to make everything easier so he decided to go back to our starting point to pick up the car to make my mum’s journey shorter. 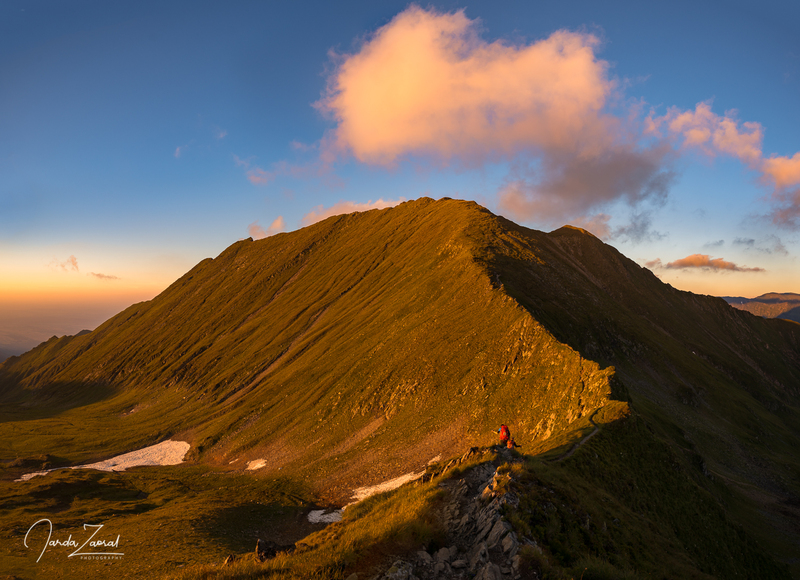 I decided to wake up at 4 am to conquer Moldoveanu Peak in early morning and join my mum later at cabin Podragu. This solution had one certain advantage. 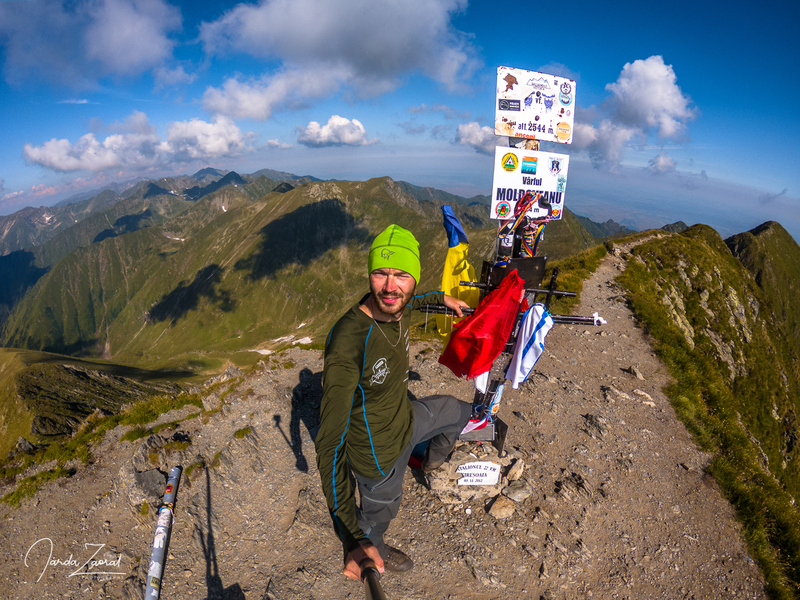 I still have the opportunity to climb the highest mountain of Romania! The disadvantage was that my sleep was very short. It could be longer but I decided to take pictures of Milky Way. It was such a beautiful night. In the early morning I woke up very tired but visualizing myself on the top gave me energy to start my hike. I was still halfway from our starting point though. I passed the last pieces of snow from last winter, witnessed a beautiful sunrise and enjoyed views over spacious green mountains. The journey was long and there were no people around. 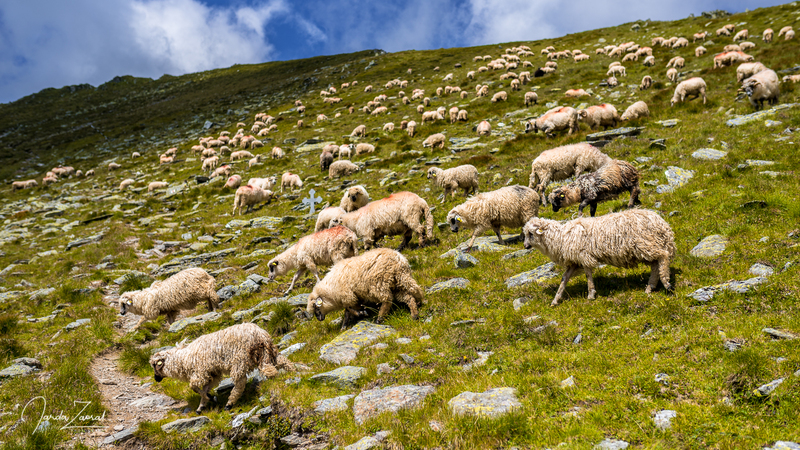 The only living beings I met were sheep. It could be an amazing day but I always had in my head my injured mum waiting for me so I tried to hurry as much as I could. Two hours later though I needed a break. I suddenly became too tired to continue. I decided to put my tent and sleeping bag under a large stone to have a lighter bagpack. My hike became better but not for a long time. Soon I was tired again. The backpack was still over 20kg. I decided to even leave my drone and my computer under several stones in order to be able to continue. One more hour and I finally conquered Moldoveanu Peak. I was super tired but the view was excellent. A pity I couldn’t enjoy it for a long time because my mum was waiting. I didn’t want to let her go alone. In the end I stayed only for the essential pictures and I headed back. On the way back I realized I didn’t have any local money and no food either so my mum was the only potential source of new energy at cabin Podragu. After realizing that I even started to run back. Luckily, I found one energy bar Lifebar Protein in my bag which gave me enough energy to see my mum. She was still waiting. She said her deadline before leaving was in ten minutes. How lucky I was. I ordered a local soup, main dish and a local beer. Much better. I felt like a reborn Jarda. I felt ready to descent. My mum got new energy too but her ankle hurt. Let’s hope we’ll make it. If I said the journey to Moldoveanu Peak was long, then I don’t know what to say about the descent to the village Arpașu de Sus. First few kilomters were scenic but once we got into forest the journey got boring and never ending. Even my watch turned off because of low battery. That long was this terrible descent. When it looked like we are finally reaching road where my father was supposed to wait, the path suddenly started to go up. One curve, second curve, third curve, fourth curve until I suddenly screamed: “Kurv∗!” Only 10 more curves up and finally the hill ended. Then we just had to go steeply down and there was my father waiting. We managed! After taking off her shoes, my mum’s ankle got three times bigger and she wasn’t able to walk on it for one month. Never underestimate mountains. This could end up much worse but we managed in the end. So proud of my parents. Make the summit in two days. Tent halfways or stay over in cosy refuge Podragu. 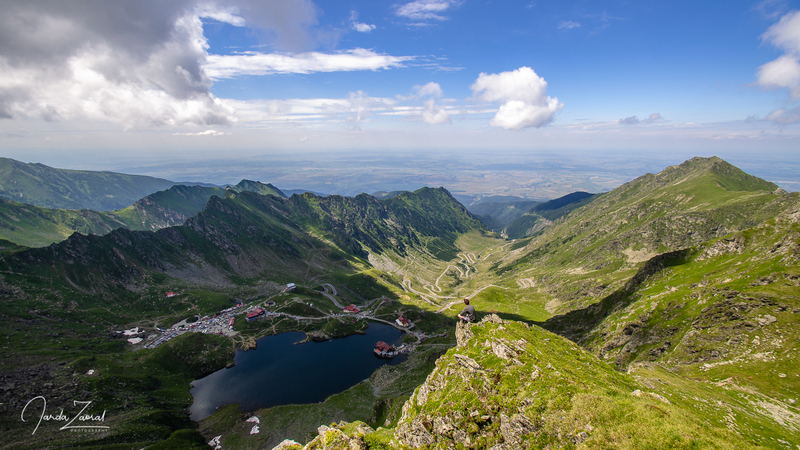 If you have longer time you can cross the whole Făgăraș mountain ridge. The whole trip takes ca 7 days.